This morning, I decided to have a bowl of Special K. No, that's not a street name for hash here in Amsterdam, that's the cereal from Kellogg's I often enjoy in Toronto. 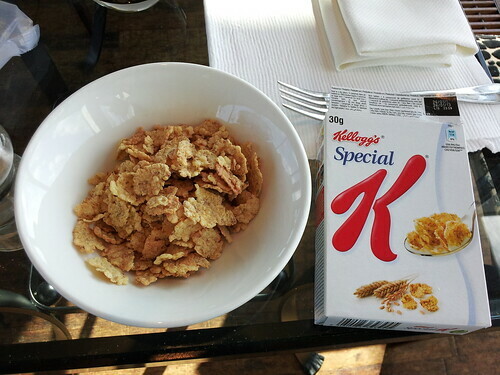 It seems Amsterdam's Special K isn't the same as the Special K we have in North America Canada. For the record, I prefer our Special K.
Just like Sugar Corn Pops is disgusting in the States, tastes and looks like real corn?! While out in Dutchland, try the Chocolate Sprinkle sandwiches, thats how the Dutch do it, as opposed to Nutella. Dark Chocolate Sprinkles on some fresh bread and butter. Tasty! Enjoy. What is the street name for hash in Amsterdam Mike? It seems they're calling it.... hash. Chocolate sprinkles are probably just as bad for you as Nutella is. Who knows. Chocolate tastes good, but too much of it is bad for you. Well, at least the rain has gone away for now. That's a good thing. Let's hope it doesn't come back for a while. Hockey is going to go on strike I think they will be locked out. Stupid idiots. I'm waiting for my hockey and we might not get it. Why can't baseball go on strike again? I think it's about time we had another baseball strike. Make it happen.